With the plethora of contemporary art on view in New York during Armory Arts week, it has been instructive to note the contribution by architects to the design of these temporary exhibition spaces, and the use of interesting architectural spaces. The fairs are often held in structures originally used for other purposes — piers, parking facilities, drill halls — so the task has been to not only carve out space for display, but to move viewers (and buyers) with flexibility and ease and to provide an enticing environment. Fair organizers have turned to young architects for these interior layouts, or have chosen compelling venues. 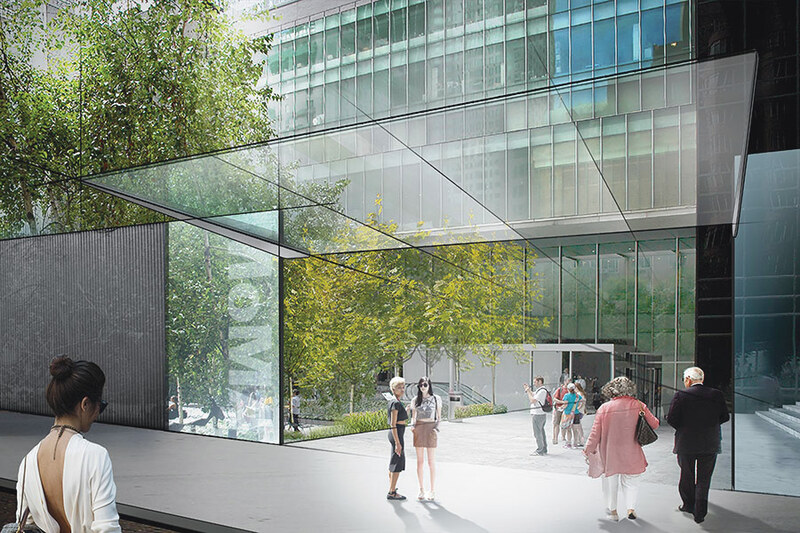 Piers 92 and 94, the site of the Armory Show, was designed by Bade Stageberg Cox (BSC), as they have since 2012. The theme this year is “Thresholds,” and the intention is to slow down the sprint through the seemingly endless rows of displays. The large ticket desk is a transitional space to cushion entry. On the floor is dark grey carpeting punctuated by light grey rectangles to demarcate lounges and areas of respite. Cut-throughs permit easier navigation, rather than having to hit the end of a long corridor before round the corner to the next row. Thankfully, a staircase has been reintroduced between the two piers (last year one was forced into the cold outside) which has been cloaked in translucent fabric. BSC also designed seating used throughout the lounge areas. The Independent, held in the old Dia Building on West 22nd Street, engaged architects Andrew Feuerstein and Bret Quagliara, who created a layout inspired by the tangram, a Chinese “dissection” puzzle that uses many triangles and is said to help develop spatial reasoning skills. Diagonal walls demarcate the 40 galleries on three floors, but there are no “booths” so the artwork bleeds together in flowing sight lines. The result is that the components feel part of a wider whole. The architects worked with gallerists to tailor the spaces based on the work they planned to exhibit. Each floor has large windows on the north and south sides which bathe the space with natural light. The site of Scope art is the Skylight at Moynihan Station. This would seem to indicate an upper aerie, but it is actually the working back-end of the McKim, Mead and White James A. Farley Post Office entered on West 33rd Street. The skylit postal dock and mail sorting rooms are now an open industrial shed subdivided into gallery booths and lounges. Natural light from above is perfect for showing art. The Moving Image Art Fair is at the Tunnel, 220 Twelfth Avenue, a former warehouse turned nightclub, where Grimshaw’s offices are located. And the Art Dealers Association’s The Art Show is held at the majestic Park Avenue Armory, which was just renovated by Herzog & de Meuron. Not a temporary art fair, but another contemporary art extravaganza opened this week—the Whitney Biennial (closes may May 25). 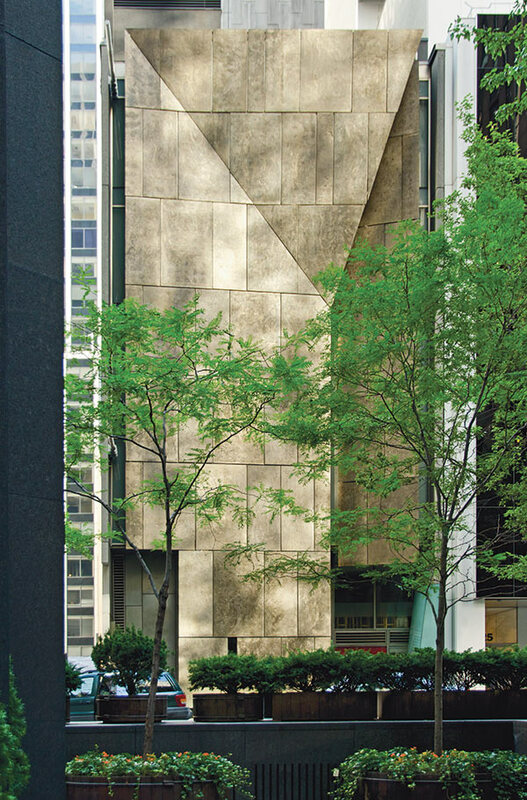 It will be the last one to be held in the Marcel Breuer building on Madison Avenue. 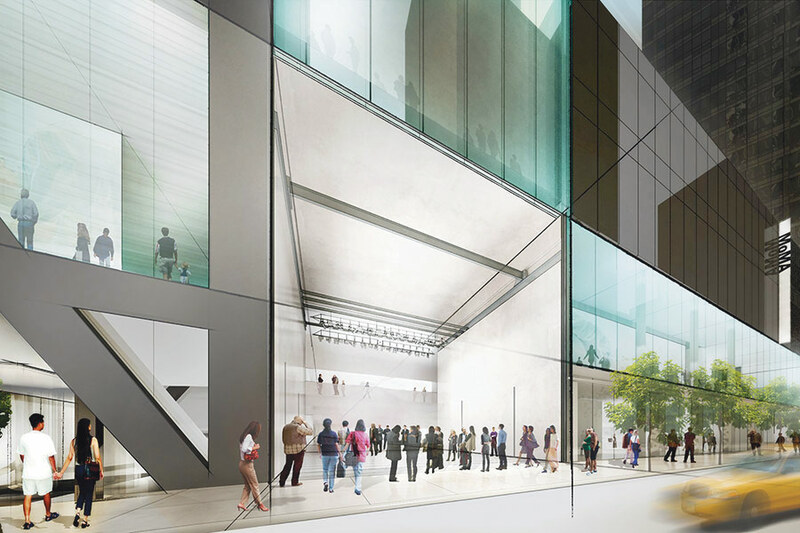 One of the three curators, Anthony Elms, kept returning to a question he found in the notes that Breuer made when designing the building: “What should a museum look like, a museum in Manhattan?” For Elms, “just as Breuer’s Whitney with its heavy walls and retreating facade — unapologetically sets its own material and temporal identity against the city’s quotidian business rhythms,” his installation features works central to this thinking, in particular Zoe Leonard’s camera obscura called 945 Madison Avenue, 2014, that uses the large, trapezoidal window on the 4th floor to bring the inverted image of the city inside. The museum itself become a frame for creative investigation. 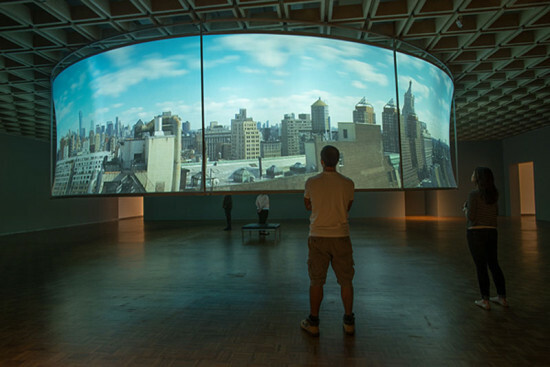 Artist Sergei Tcherepnin, chosen by another curator, Stuart Comer, attached transducers (devices that convert signals into vibrations) onto eight Breuer light fixtures in the lobby, which make the overhead lighting into synthesizer “speaker-instruments” channeling sounds from the building itself in Ambient Marcel (Waiting, Working, Erupting), 2014. 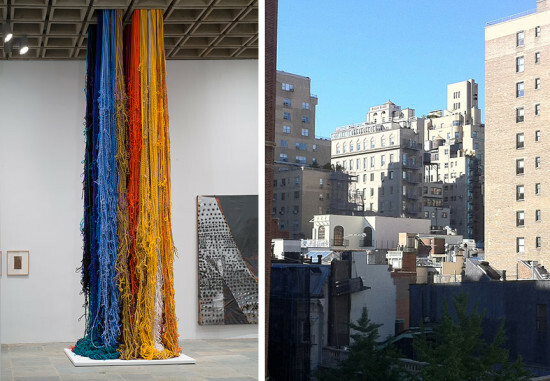 Biennial artworks with architectural references of note include John Mason’s Vertical Torque, White, 1997; Joel Otterson’s 187 Bottoms Up, 2013, Sheila Hick’s Pillar of Inquiry/Supple Column, 2013-14; Ken Lum’s Midway Shopping Plaza, 2014; Martin Wong’s Closed, 1984-85; Lisa Anne Auerbach’s American Magazine #2, 2014; and Etel Adnan’s New York From the Triborough Bridge to South of Manhattan New York, May 21, 1990. At the fairs, architectural works included Yutaka Sone’s Little Manhattan, 2007-2009 (Armory, David Zwirner); Kim Jones’s Doll House, 1974-2013 (Armory, Pierogi), Ahmed Mater’s Metropolis, 2013 and Ground Zero I (Armory, Athr Gallery), Do Ho Suh’s Specimen Series: Berlin Apartment, 2011 (Armory, Lehmann Maupin); Paul Ramirez Jonas’s Admit one: Tishman Auditorium, 2012 (Armory, Nara Roesler); Chen Sai Hua Kuan’s Space Drawing No. 7, 2010 (Moving Image, Osage); Nicole Cohen’s Champagne Room, 2013 (Moving Image, Morgan Lehman); Charles LeDray’s Picnic, 2005-2013 (ADAA, Sperone Westwater); Gavin Turk’s Small Door (Yellow & Green), 2013 (ADAA, David Nolan); Roxy Paine’s Emulsion, 2012 (ADAA, Marianne Boesky); James Castle’s booth (ADAA, Peter Freeman); Vera Lutter’s Fulton Ferry Landing, Brooklyn, May 21, 1996 (ADAA, Weinstein); Kelly Reemtsen’s Eames Rust Side Chair Right View, 2007 (Scope, De Buck); and David Kramer’s Night Moves, 2014 (Scope, Long-Sharp) features the headline “I Should Have Bought Real Estate” over a nighttime skyline. Designing the Creative Child is an in depth essay on how and why creativity and childhood became so closely linked after the Second World War, and why middle class parents became almost obsessed with raising creative children. 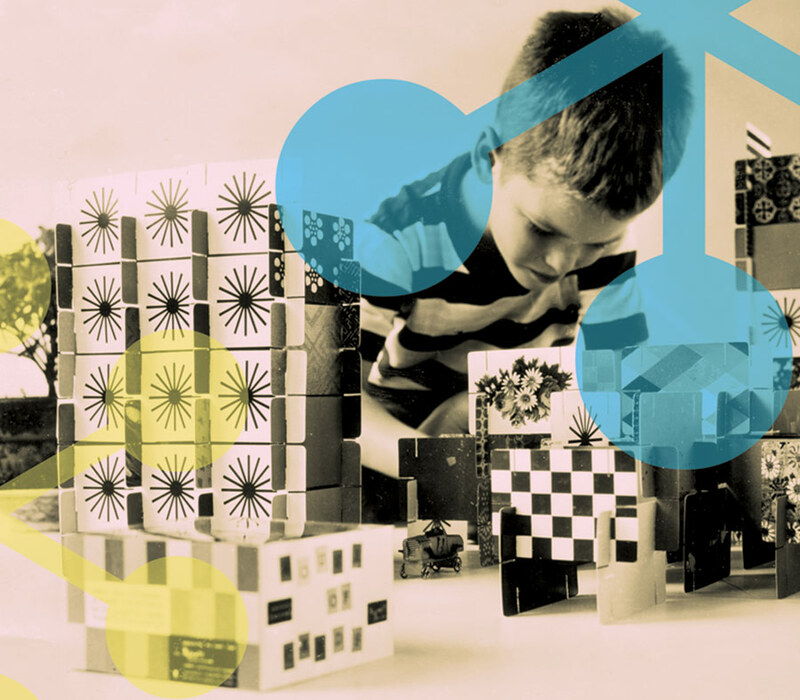 Amy F. Ogata, professor of modern Architectural and Design History and Material Culture of Childhood at the Bard Graduate Center in New York, describes how children’s capacity for imagination and independent thinking became a widespread and cohesive national value by the mid-1970s. Once an elitist concept, creativity was adopted by the middle class after the Second World War, then became a tool to strengthen national competitiveness and successively transformed into an ideal and icon. With the Cold War and the triumph of consumer culture, schools, magazines, television, museums, and the toy manufacturing companies actively and successfully designed, shaped, and merchandized the image of the creative child. Pushed by the television, educational institutions and discourses, the image of the creative child proliferated throughout the public and private space. Ogata dedicates a chapter to each, as she calls it, “material object”: the educational toy, creative living at home, building creativity in postwar schools, learning imagination in art and science. She evaluates the experts’ discourse on parenting, psychology, and anthropology such as Benjamin Spock, Margaret Mead, and others. Their contributions were widely received and fashioned the image of the natural child as raised in an inclusive, flexible, and democratic culture—in opposition to the oppressed Soviet child living in dictatorship. Young suburban families felt responsible and challenged to raise “better” children. They adopted the educational toy mostly designed in abstract forms and manufactured in wood, designed to teach physical skills or develop cognitive abilities—and were able to afford these expensive toys. Toy companies, such as Creative Playthings, relied on contemporary artists and designers and became linked with sophisticated taste and modern aesthetics. Immediately after the Second World War, the nation was challenged by the extensive need for new school buildings and the multiplication of teaching and building concepts. European architects brought new concepts to the U.S., opening a field for experimentation with the aim to create “open” and flexible learning situations. After the Soviet Union launched the Sputnik space satellites in 1957, concerns about the competitiveness of the nation’s education rose dramatically. The government made efforts to strengthen the science curriculum at public schools, to foster experimentation and creative learning. Parallel to this, in the late 1940s museums took leadership in shaping the “domestic landscape” for middle-class families by setting aesthetic standards and promoting new models. 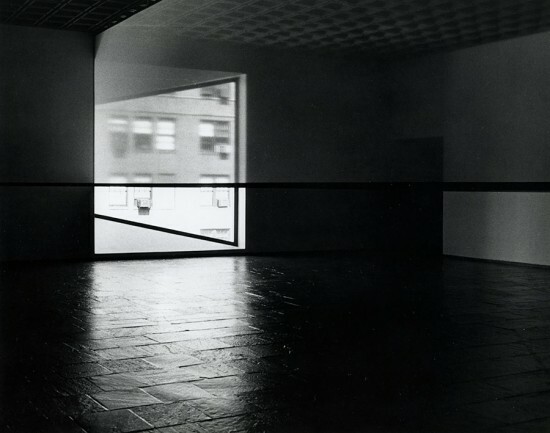 Museums such as the Walker Art’s Center in 1947 (Idea House II) and MoMA in 1949 with Marcel Breuer’s installation of a model house in the sculpture garden, outlined a postwar vision of domesticity that included spaces solely dedicated to children. It reflected the experts’ advice to provide enough play space at home to encourage a child’s inner life and creativity. Postwar parents shared more space and time with their children, family ties became more and more normative, and gender roles were further inscribed into domestic space. “Expressive creativity” became the most prominent objective of art education, at home, school, and museums. Art education’s higher goal was to improve society at large. Museums, such as the Met (in 1941) and the Art Institute of Chicago, pioneered Junior Museums and art programs. Under Victor d’Amico’s (1904–1987) direction, MoMA’s art program reached international renown for liberating children’s creativity and pushing them to explore materials, textures, and imagination. Starting in 1942, the Children’s Festival of Modern Art emphasized the joy and playfulness of making and learning about art. Coined Holiday Art Carnival, it traveled to the World’s Fair in Brussels in 1958 and Expo 67 in Montréal and then continued to operate at the Harlem School of Art. Designing the Creative Child is a valuable and inspiring resource for scholars and professionals in child related research, it lays out how the image of creativity became ubiquitous, from Curious George to children’s furniture to the museums’ art programs. The image is mostly complete, but some questions remain: Why didn’t the cultural elite develop a more critical attitude toward consumerism? When and why did the ideal of creativity become a cliché to then fade almost completely? What is the relationship of the Creative Child to American culture at large? How was it possible that the Beat Generation and the emerging suburban middle class seemed to have shared, for a moment, the same ideals—yet with very different results and consequences? From the late 1930s through the early ’60s, few photographers documented the changing residential lifestyles of the nuclear family as extensively as Maynard L. Parker. 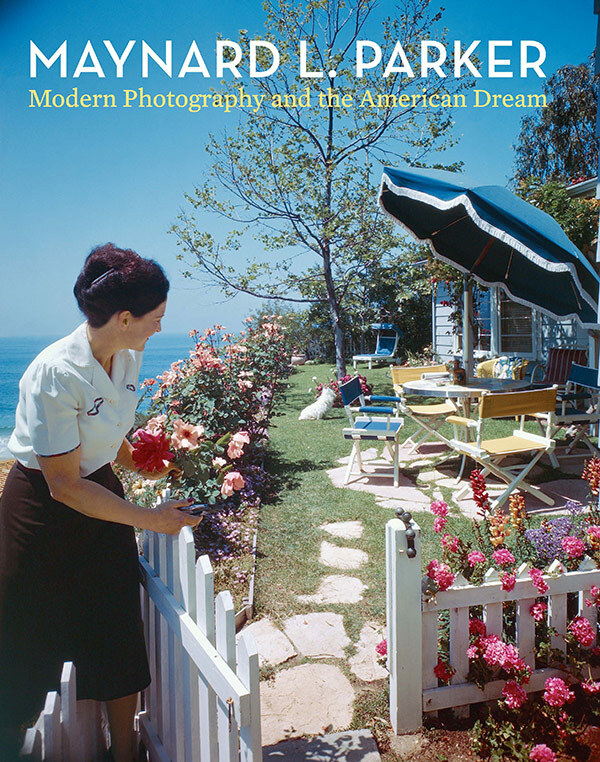 Crisscrossing the nation, primarily for House Beautiful magazine and Better Homes & Gardens, Parker made photographs that championed the slowly emerging modern esthetic of the suburban Ranch-style house and the impact of the postwar consumer extravaganza. Editor Jennifer Watts has put together a nice monograph on the best, most typical images Parker produced, starting from the peak of his long career. Still, these images read much more as a fun history of postwar suburbia and the growth of Southern California than as a documentation of the period’s architecture. Flipping through this book reminds you of going through old Life magazines while watching Leave it to Beaver. Modern kitchen appliances, hi-fi systems, and table settings are given equal footing with the architecture. Watts also does a nice job of providing a context to Parker’s photographs. 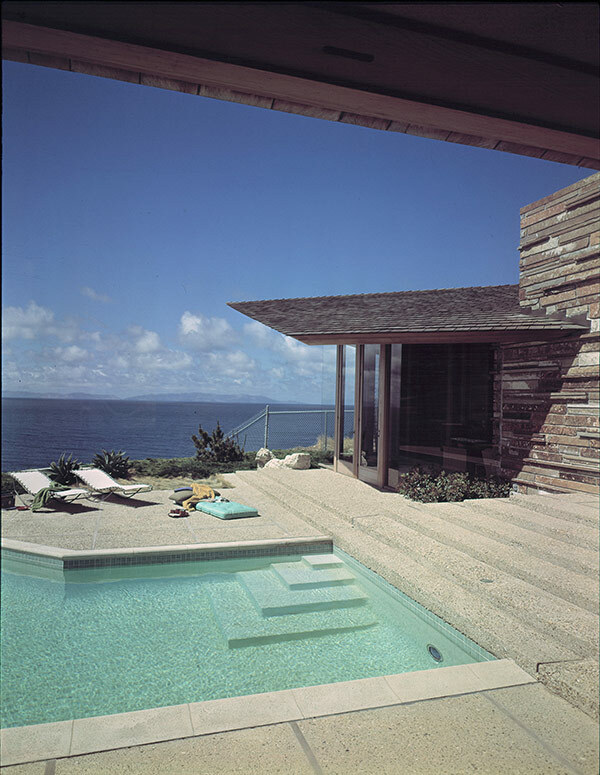 Parker, working the same territory at the same time as Julius Shulman, was the go-to photographer for shooting the interiors of homes owned by Hollywood stars and the growing number of wealthy entertainment executives. As much as Shulman glamorized the Hollywood “house on the hill,” his aim first and foremost was about photographing the architecture. For Parker and the shelter magazines, it was about promoting a style and lifestyle that readers could either aspire to or at least live vicariously. 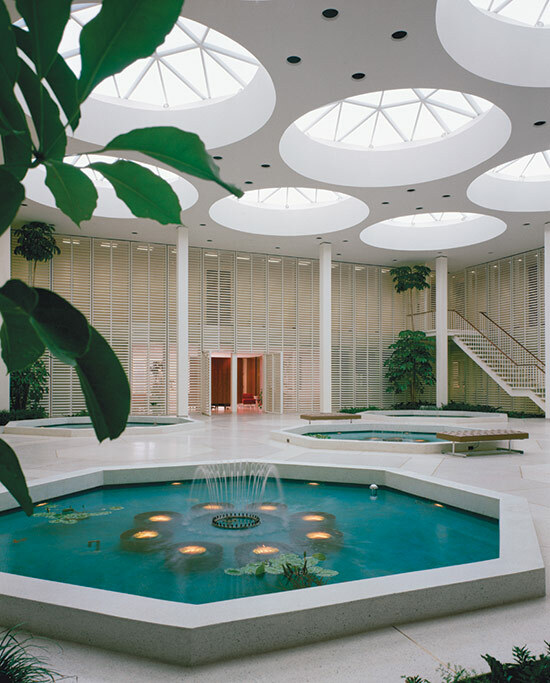 While Shulman was winning commissions from architects such as Pierre Koenig, Richard Neutra, and Raphael Soriano, Parker was left with shooting, for the likes of Quincy Jones, Leo Blackman, and Cliff May, housing developments, along with department store interior design service installations. Although Watts has put together a book that shows Maynard Parker at his best, sadly this is still not saying a lot. Through House Beautiful Parker photographed a number of Frank Lloyd Wright projects and some of Edward Durell Stone’s work. But even the most avid Wright fan would be hard pressed to conjure up a single one of these images. Maynard Parker was clearly a hard-working, prolific, successful and very good photographer, just not a great one. 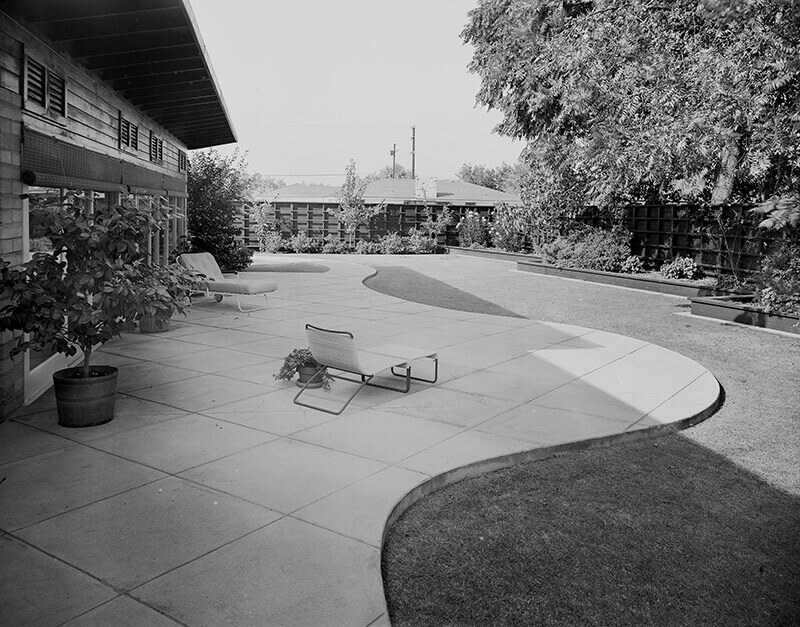 Judge Anderson Residences photographed by Parker in 1963. The three pillars of midcentury architectural photography were Ken Hedrick in Chicago, Julius Shulman in Los Angeles, and Ezra Stoller working out of New York. They are not equal, though. It is no exaggeration to say Ezra Stoller is the father of modern architectural photography. Stoller’s compositional aesthetic and technical mastery place him in the 20th century photographic pantheon with the likes of Ansel Adams, Berenice Abbott, and Edward Weston—this despite his being an editorial photographer who never aspired to be a fine art photographer. 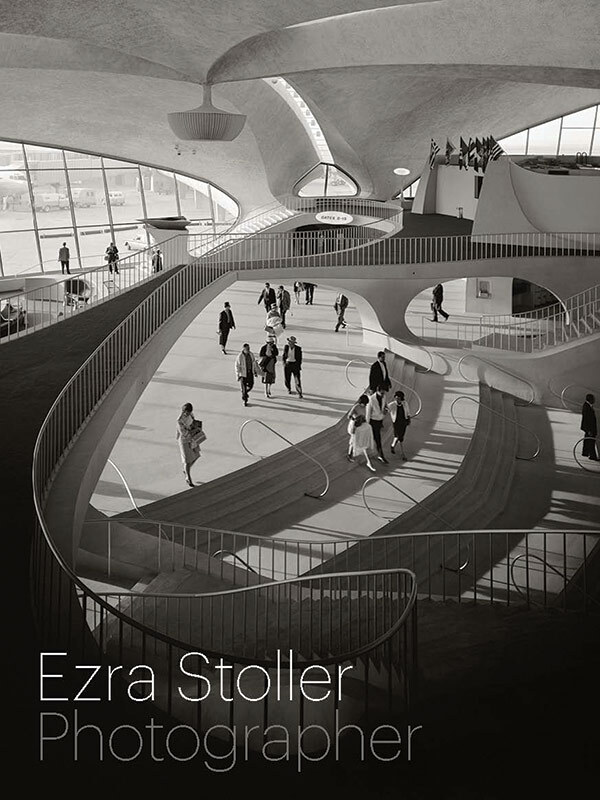 Ezra Stoller Photographer, edited by Nina Rappaport and Erica Stoller, the photographer’s daughter and the owner of the Esto Photographics agency and archive, is a beautiful compilation of one iconic image after another that Ezra Stoller created during a 40-year career. 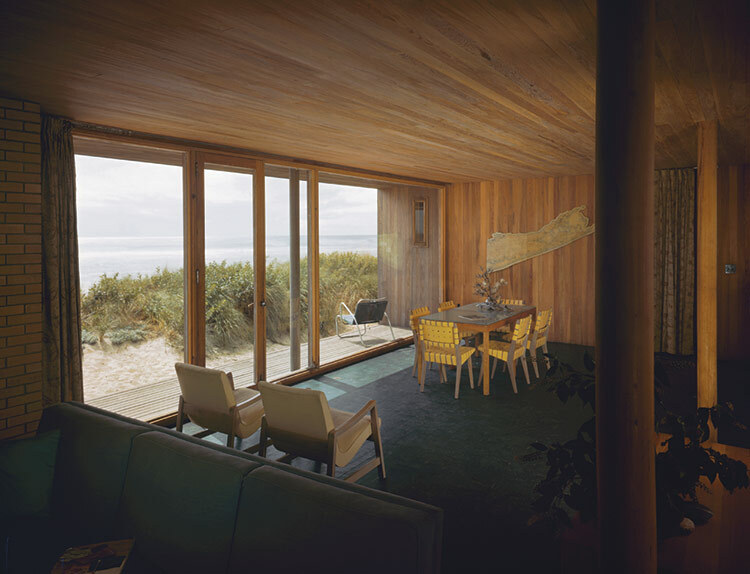 Stoller photographed most of the best midcentury architectural masterpieces and created truly memorable images. When we think of either Saarinen’s TWA terminal, Wright’s Falling Water and the Guggenheim Museum, Philip Johnson’s Glass House, or Louis Kahn’s Salk Institute, we invariably think of these buildings as an Ezra Stoller image. And for many great buildings, Stoller’s images are all that is left, thereby becoming the last word. Examples include Wright’s Johnson Wax Tower and headquarters, Morris Lappidus’ Americana Hotel, and the New York State pavilion from the 1964 World’s Fair. 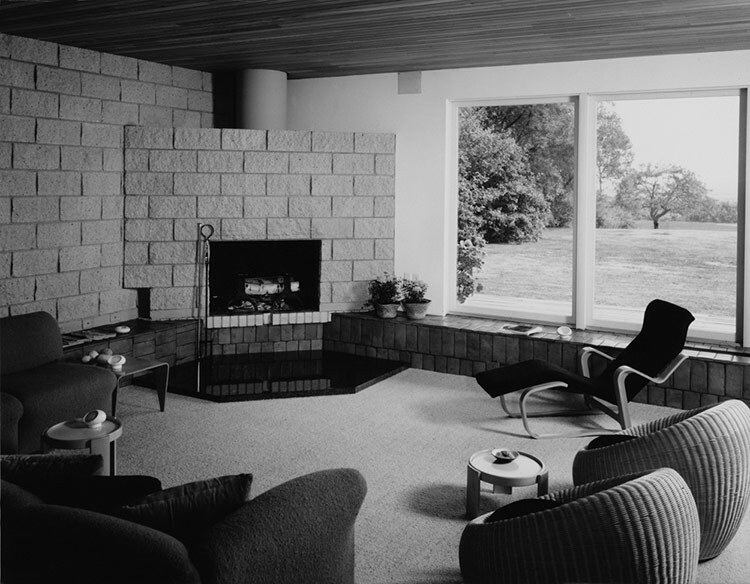 Stoller’s photographic style of simple, clean, graphic compositions was a perfect complement to the clean-lined and unadorned simplicity of modern architecture. Oft times Stoller could summarize a building in one shot encompassing all its essential elements. It is not a stretch to say that some of the projects Stoller photographed are considered great architecture merely from the credibility Stoller’s images bestowed upon them. The Parking Garage in Miami, by Robert Law Weed, is a good example, showing each car carefully positioned without hindering the graceful floating effect of the stacked decking. This was truly “form following function.” Still, the structure was also just a parking garage. Yet Stoller’s image forces the viewer to appreciate it as a functional work of art. It is no surprise that Stoller accumulated a client list of the best modernist practices and firms throughout the country. In addition to those already named, Stoller shot extensively for Skidmore Owings and Merrill, Mies van der Rohe, Paul Rudolph, Marcel Breuer, and I.M. Pei. Erica Stoller gives us just enough background detail about her father’s education (NYU architecture and industrial design), unlimited energy, and thoroughness in understanding his subject that we can better appreciate the creative source of the images. She shares how her father would not only scout a building for the best time of day to shoot but sometimes hold off until the right time of year. She then steps aside and lets the images speak for themselves. Nina Rappaport, meanwhile, writes extensively about Stoller’s under-appreciated industrial images. Fortunately, many pages are dedicated to showing off his great catalogue of, once again, beautifully composed and technically near-perfect images. Stoller’s industrial images are the hidden treasure of his vast career catalogue. 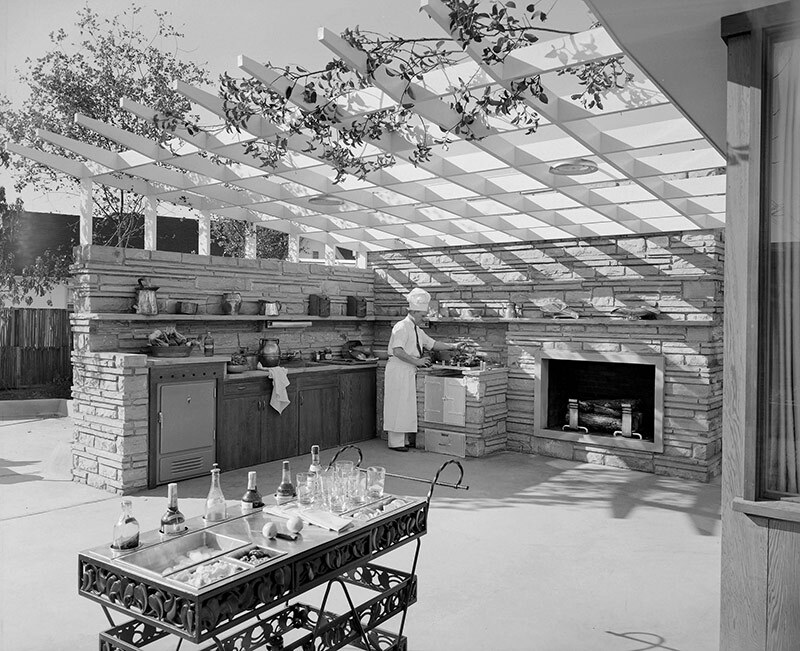 In his industrial imagery, as in his architectural images, the Stoller style is ever-present. Simple compositions are often dramatically lit, but not overly lit, to bring out the beauty of the subject, be it a pharmaceutical manufacturing plant, paper plant, or hydroelectric dam. It is some of these detailed images that have the fine art quality of an Edward Weston photo. Overall, Stoller’s work was a perfect blend of compositional artistry, technical know-how, and patience. 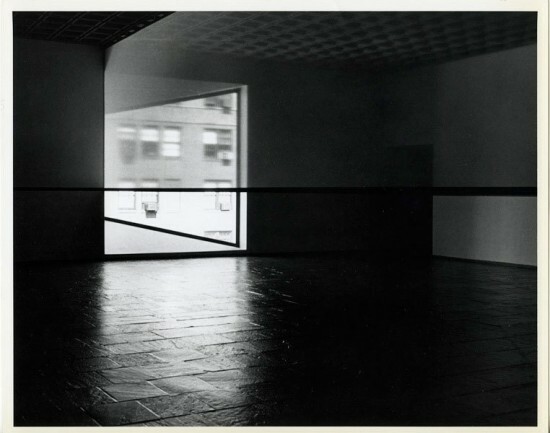 For someone who was simply documenting others’ work, Stoller blurred the line between the architect’s art and his own. 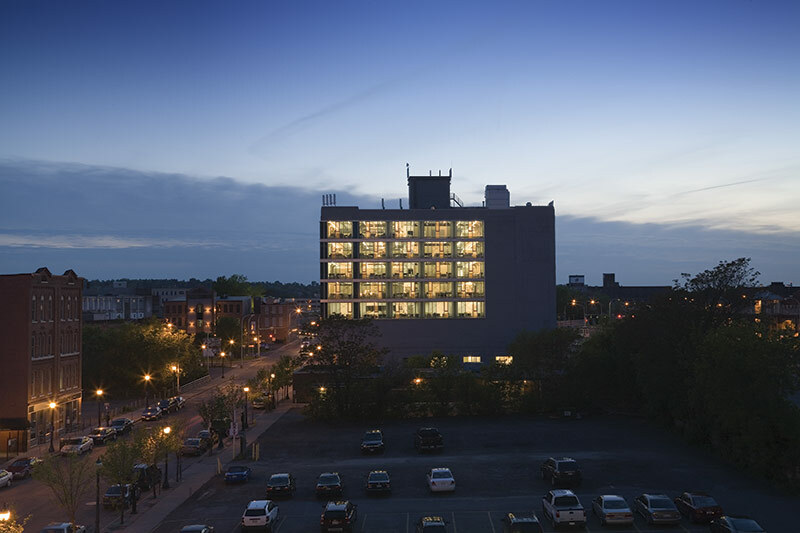 Renovated warehouse served as a temporary home to the Syracuse School of Architecture. 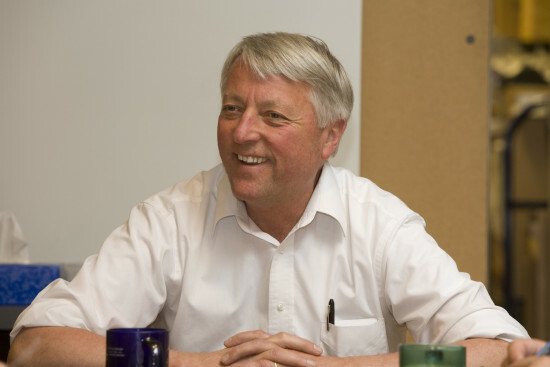 In conversation with AN’s editor-in-chief, William Menking, Mark Robbins reflects on his time as Dean of Architecture at Syracuse University, the role of architects, his artistic practice, and his plans for the International Center of Photography, where he is taking over as Director. The Architect's Newspaper: Is there a common thread that holds the many facets of your professional life together? Robbins: For me education is a through line. As an artist, the work that I do has to do with critical practice; understanding space as a place where there are intense social interactions and multiple forces come into play. As a curator, I had to think differently about the way in which work could be presented so that it was available to disciplinary audiences, to professional audiences, people who are interested in architecture, in design, but also to non-specialized audiences. That sense of speaking to people who are not like us or like, you know, artists or architects, was intensified by my time in government. You know, I think when you live in New York or if you are within an arts organization you have certain assumptions about what the kind of general field of conversation is or the general field of shared knowledge, and then when you are in government you are dealing with people who come from vastly different backgrounds. I think part of what I was hoping to do at Syracuse was to think about the ways in which a school of architecture could perform like a cultural institution. To do broader education, not only for young architects but for the region and a broader population. I wanted to let people in the other academic disciplines know that we existed and could overlap with issues of public policy, with issues within the humanities and the social sciences, that we were kind of part of that academic discourse but that we could also have an impact on the physical form of the city, that we could also participate in the market. So I wanted to educate students to perform in such a way that they could communicate to audiences of non-architects. If a student didn’t know what a pro forma was, he couldn’t make a case to a developer. Tell us more about moving from a cultural institution to government? I’d rather think about issues. Now the rhetoric surrounding sustainability is another way out of all of our discussions being about style and more about performance, but my sense is beauty is part of the performance criteria. At Syracuse we’re doing a series of five books with help from the Rockefeller Foundation on American Housing. It’s a survey of in-fill reuse and towers, and so it’s a way of looking both at market and non-market rate housing and senior citizen housing. Koning Eizenberg’s work is in it and Stanley Saitowitz’s work, Della Valle Bernheimer’s, and ARO, and others. What will be your continuing legacy at Syracuse? There are programs that were set up which will now roll out. There was setting up the program in London to work with a program in New York and in Florence, the idea that students would be exposed to urbanism. So you could live in Florence for six months as a student and understand a kind of traditional urbanism and the medieval city, then you could come to London and look at the city, which was rebuilt after Wren, and you could come to New York and look at the mercantile city, the kind of graded and rationality of the commissioner’s grid, and then go to Syracuse and quite authentically begin to study Syracuse as a type of the postindustrial city. One of the books that we’re doing is called the American City X: Syracuse After The Master Plan. In that we will publish the 24 projects or so that we did, both on campus and off campus, and then the infrastructure that connects the two. They created this position for me called the University Senior Adviser on Architecture on Urban Initiatives. Students were able to see architecture as having greater agency in the public sector but also to build demonstration models for the way architecture performs. We also brought in Barry Bergdoll because we have the Breuer archives and we were able to do an exhibition of some of the work in these archives. Barry has continued to work on his book, which the students helped to work on. So we do that kind of work but then we also built those high performance houses by Della Valle Bernheimer with ARO, Onion Flats, Cook + Fox. And then there’s the connective corridor, which was originally by Field Operations, who won the competition, and then we brought in OLIN to do the work of connecting the downtown to the campus. We use part of it and the university uses the rest. So it’s still the School of Architecture and the Fine Arts. But that has local spillover. There are ways in which this benefits the city. A private developer developed one site close to it, which is now a 300-person engineering firm, and there’s a new development for Marriott Hotel going in on another development parcel. You do an anchor with a strong tenant and then it makes a neighborhood newly attractive to other developers. So, there have been three or four major parcels developed since the warehouse was revamped. You want a single investment to have multiple outcomes. Let’s talk about your vision for ICP. ICP is a place that I've known about since I was a little kid. My mom was involved in the exhibitions. Oddly enough, I met Kenneth Anger in their galleries. So there's a kind of full circle. While I was still in undergraduate school, still at Colgate doing this film work, I met him. For the past ten years or so my work has been certainly as much photographic as it has been installation based, which you can see in the show at Colgate. ICP is an institution dedicated broadly to the image or to the image broadly. It's really both. I want to expand the notion of the way we look at image making, and images as cultural currency, as a currency for communication, and to make ICP the hub for discourses about the image, and also for commissioning work as well as exhibiting work. And so my sense is to make a cultural institution that has that as its legacy is kind of critical, especially in this century. I would like to look at the image in a more Catholic way, in a broader way. To be an institution that’s based in New York, but that has global reach–-it is the International Center of Photography—I want that to be really critical to its ethos. ICP was started as The Fund for Concerned Photography. The Founding Director was Cornell Capa, whose brother was Robert Capa, who did those fantastic images of the Spanish Civil War. So its roots are in documentary work, and work that was explicitly about social commentary. But the institution has grown to include what would be seen as work that’s as much about personal expression, as about social documentation. I'd like to see ICP as both an agent for having work occur in the world through commissioning, but also exporting and being catalytic both locally and through collaboration with academic institutions, with other cultural institutions, and also to be engaged in a more international sphere with other cultural institutions, but also perhaps in unexpected ways, with academic institutions. At ICP we have a remarkably talented curatorial staff and I think one of the best schools of photography in the world. ICP has been doing phenomenal work for close to 40 years and it needs to have a broader impact both within the constellation of New York cultural institutions, and in the international and global sense. Long Island Modernism 1930–1980, by Caroline Rob Zaleski, has arrived to prove that notion impressively wrong. The 25 architects under discussion are not names you would readily associate with Long Island—Frank Lloyd Wright, Richard Neutra, Ludwig Mies van der Rohe. Some of the names, like William Lescaze, Wallace Harrison, and Edward Durell Stone are only slightly less prominent. And some, like Jane Yu and A. Lawrence Kocher, deserve more attention. The book is a result of a field study of modern buildings being conducted for the Society for the Preservation of Long Island Antiquities. Zaleski, an architectural preservationist and historian, is the director of that survey and an important advocate for Long Island’s modernist heritage. The Levitt and Sons office building in Lake Success, New York designed by Edward Durell Stone (left). 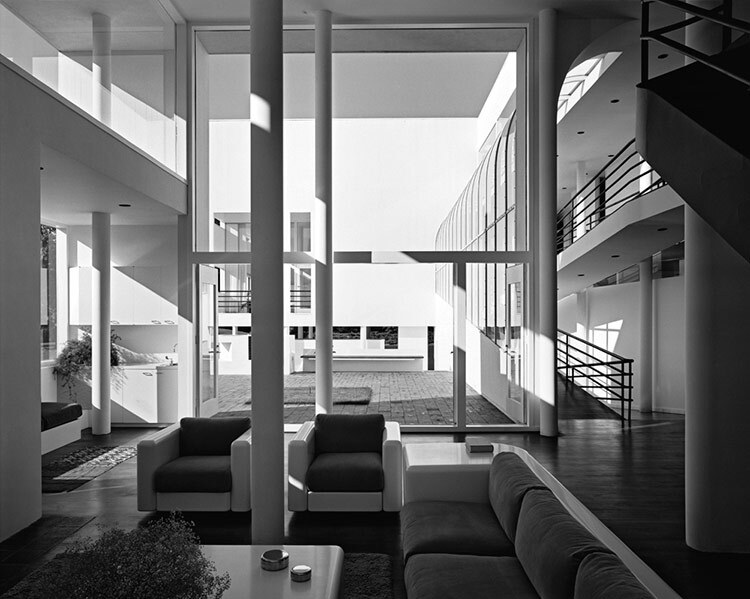 Richard Meier's Alvin & Joan Weinstein House, Old Westbury, 1971 (right). Many of the projects detailed here were responses to the two great showcases of modern ideas in Flushing Meadows, Queens: the World’s Fair of 1939 with its theme of the “World of Tomorrow” and the World’s Fair of 1964 built in reflection of our nascent Space Age. The A. Conger Goodyear House, designed in 1939 by Edward Durell Stone, is an important transition piece from the European mansion mentality of the North Shore, “Newport on the Sound,” to European modernism. (Zaleski fought successfully to save it from demolition in 2002.) Goodyear, heir to a timber and railroad fortune, left his wife and four children back in Buffalo in 1938, moved to New York, and made his entrance into North Shore society by buying 110 acres on the highest hill in Old Westbury and putting a generously fenestrated, white brick house there. An art collector, patron of the avant-garde, and self-declared Futurist, Goodyear was also the first president of the Museum of Modern Art in New York. His architect, Stone, making his entrance into modernism, had lately worked on the art deco-fication of the Waldorf Astoria, and Radio City Music Hall. Stone had a long affluent run on Long Island, which paralleled his public career as the architect of note on commissions like embassies and performing arts centers. His Lloyd Harbor house for Gabriele Lagerwall looks like a literal cross between his embassy in New Delhi and the Kennedy Center in Washington, D.C.
Zaleski rises to the occasion, as architectural writers so often don’t, when pressed into play to give social context to builders and their buildings. The book is a fascinating history as well as field study. Gabriele Lagerwall, later to become “the Baroness,” is, in Zaleski’s description, “the sometime companion of numerous very rich men.” (And you thought people moved to Long Island because the schools were good.) In 1961, she buys 32 acres from the Colgates, and hires Stone, himself a member of her own international set, to design the perfect house: “a gilded getaway for a high-toned, insouciant crowd.” He does. The Villa Rielle, as it is known, has a central atrium with a large reflecting pool, where Miss Lagerwall entertains guests during the cocktail hour by taking a swim with them, the Holly Golightly of Long Island. Richard Meier's Richard Maidman House, Kings Point, 1971-76. Smaller, adventurous architectural outings are also important chapters of their own. There are several early attempts at prefabricated homes included: Albert Frey and A. Lawrence Kocher's Aluminaire House, which Wallace Harrison and his wife Ellen purchased to live in while they put up their own house in Huntington in 1932. 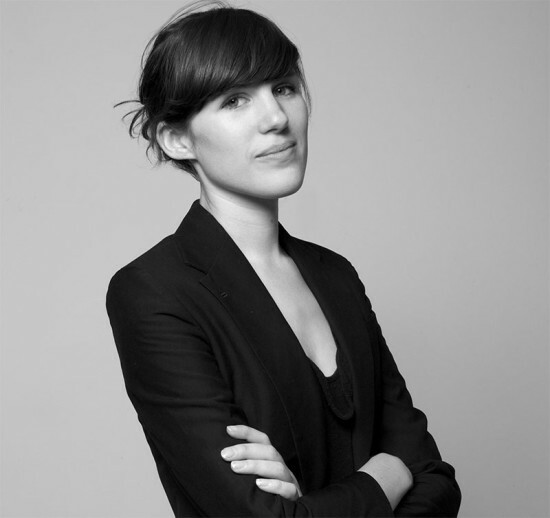 Frey had worked in Le Corbusier’s studio; Kocher was the managing editor of Architectural Record. The Aluminaire House, sleek on paper, was difficult to construct, leaked, and the Harrisons, after eight years in it, dubbed it the “Tin House,” for its quintessential ramshackle quality. Kocher, personally, was interested in starting an “American Bauhaus,” on Long Island, and corresponded pleadingly with Gropius about it, introducing him to deans stateside until he inadvertently landed him a job at Harvard, not Columbia. The Fort Salonga Colony, 20 acres Kocher purchased near Northport, became the site for his own weekend house, the Canvas Weekend House (this time, cotton duck for walls, not aluminum), and in lieu of a school, he talked three other families into purchasing lots and putting up “experimental” houses. The Canvas House, one room on stilts, got lots of press understandably—it looked like a toy-train version of the Villa Savoye—but without electricity, it was basically a modernist lean-to. David L. Leavitt’s Box Kite House was a more successful adventure. Designed for an advertising executive, Bill Miller, on Fire Island in 1956, Leavitt (who was the architect on Russel and Mary Wright’s Dragon Rock; the self-promoting Wrights cut him out of the credits as the years went by) engineered a stacked structure of unfolding balconies which doubled as protective shutters off-season and Mylar walls braced in a lattice of outrigger cables that made it look like a box kite. The defiant little house—which looked like it might take off—stood bravely until it burned down from a stove fire. Philip Johnson's Eugene & Margaret Farney House, Sagaponack, 1945-46 (left). Jane Yu's Bert & Phyllis Geller House III, Lawrence, 1978 (right). And Jane Yu’s house for Bert and Phyllis Geller III in Lawrence, designed in 1978, was not only a model of innovation, but a telling architectural-world morality tale. 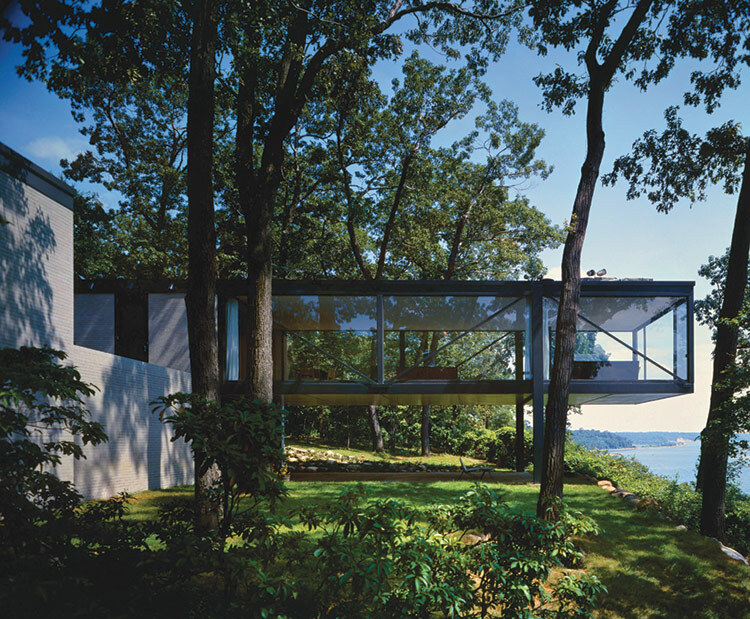 The Gellers had already built two houses on Long Island and a showroom for their shoe company in Manhattan with Marcel Breuer. Yu, who worked in Breuer’s office as an interior designer, oversaw the showroom. When the Gellers decided they needed a new house, something smaller as they were closing in on retirement, they asked Yu, not the Great Man, to give them something simple, and quickly. Perhaps the Gellers suspected, like many who have worked with famous architects, that Breuer couldn’t do simple and quick. Yu came up with an elegant off-the-rack house: stock cedar siding, concrete blocks to suggest passages of stonework, factory-made windows. And she specified solar panels on the roof for the hot-water heater. It is a very sweet, economical, livable design. Yu got no attention for it. The Gellers encouraged her to keep quiet about it, so as not to offend Breuer. When the mayor of Lawrence admired the house and suggested she submit it for an AIA Long Island award, Herbert Beckhard, who was responsible for the house commissions in Breuer’s office, and who was a member of the AIA award committee, refused to consider it. Zalenski has acknowledged that her book is a kind of sequel to Long Island Country Houses and eir Architects, 1860–1940 by Robert B. Mackay, Anthony Baker, Carol A. Traynor, and Brendan Gill. 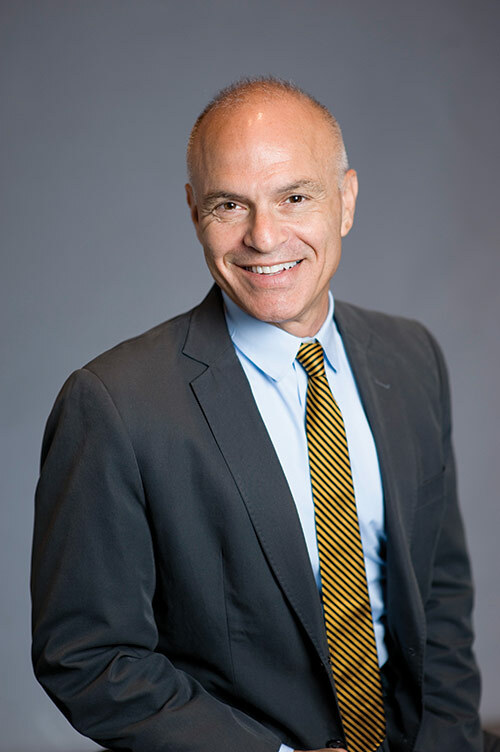 Mackay is the director of the Society for the Preservation of Long Island Antiquities, which sponsored Zalenski’s initial study. One doubts there will be a sequel to Zalenski’s book. Most of Long Island—if not the rest of suburban America—has become a postmodern mash-up now. We could easily have been learning from Long Island, as well as Las Vegas, when modernism failed at home. Zalenski’s examples are like ruins in a park. It’s sad, but heartening, to see them restored to freshness in these pages.